I've published a guest post at Melissa Karnaze's blog Mindful Construct called "3 Things The Personal Development Critics Got Wrong." It mainly deals with critics' arguments against personal development's ethic of taking responsibility for your circumstances, including the claims that this ethic encourages selfishness and self-blame. I think this article will be a useful summary for people who have recently discovered my work at this blog. I think you'll also appreciate Melissa's articles, which take an approach to personal development that's rooted in cognitive science and psychology. Enjoy! This post continues my discussion of what I've called the "responsibility ethic" in personal development -- the idea that it's best to see ourselves as responsible for our circumstances in life, as opposed to seeing our situation as the product of chance or forces beyond our control. In my last post, I noted that many personal growth teachers who advocate the responsibility ethic draw a distinction between taking responsibility for our life situation and blaming ourselves for it. Taking responsibility is healthy, they say, but "beating yourself up" is not. I also observed that critics of personal growth often object to this distinction, arguing that our tendency to "beat ourselves up" is actually what keeps us behaving morally. In other words, it's not enough just to know what's right and wrong. You won't act morally unless you fear that, if you don't, you'll be wracked with guilt. Thus, if human beings lost their capacity for self-blame, society would descend into violent anarchy. First off, I think it's important to keep in mind that this argument is purely theoretical. I don't know of any critic who has presented solid evidence that personal growth teachings are actually turning people into violent psychopaths. Nobody has shown that, say, serial killers are statistically more likely to have read I'm OK, You're OK than the average person. What the critics claim is that if, hypothetically, people took the "responsibility vs. blame" distinction to its logical extent, people would stop behaving morally and we'd all be in trouble. Let's assume, for the sake of argument, that the critics are right -- that if people fully accepted the idea that we shouldn't punish ourselves for the past, and they fully understood the logical implications of that idea, they'd start murdering and stealing with wild abandon. 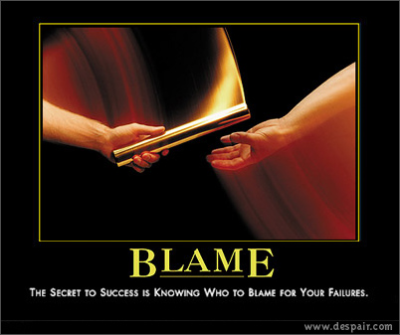 Even if this is true, that doesn't necessarily mean the responsibility vs. blame distinction is a menace to society. That would only be true if we had reason to believe that people, in practice, are taking, or will take, that distinction to its logical extent. Is there reason to believe this? Like I said, there's no conclusive evidence one way or the other, but I think a few observations are worth making. First, consider the audience. Admittedly, given the vastness of the personal growth field, it would be difficult to come up with a profile of the "average personal development consumer." But we do know that the majority of self-help book sales are made to women. I hope it isn't unforgivably sexist of me to point this out, but men commit most recorded violent crimes (and, in fact, most crimes of any stripe). Notably, in the U.S. in 2008, men committed 90% of murders where the killer's gender was known. If personal growth teachings really do turn people into miscreants, shouldn't we expect to see more criminality among women, who are self-help books' biggest consumers? Or, to put the point differently, perhaps we can all rest easier knowing that women, who appear to have a lower propensity for violence, are largely the ones buying these books. But if there's ever an upsurge in male self-help book consumption, I guess, we'd all better stock up on ammo and canned goods and hunker down for the apocalypse. Second, consider the teachings. As we saw, the critics' argument is that, if people took the responsibility vs. blame distinction to its logical extent, they would behave destructively. If this is so, personal growth teachers certainly aren't encouraging their audiences to make that logical leap. You know the typical goals of personal development: to help you make money, have fulfilling relationships, develop inner peace, and so on. We don't often see books, CDs or seminars about "Guilt-Free Murder," "Self-Esteem For Child Abusers," or "Loving Your Inner Car Thief." I don't know for a fact, but I'll make the educated guess that consumers of self-development products and services, by and large, aren't even thinking about the abstract philosophical implications of the ideas they're learning. They have specific, practical objectives, and they're interested in personal growth only insofar as its perspectives and techniques help them get where they want to go. Is Self-Blame Needed For Morality? 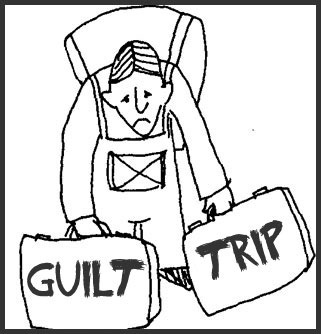 We've seen that, even if we assume in the abstract that letting go of self-blame means eliminating morality, it doesn't follow that personal growth teachers who talk about releasing guilt are, here in the real world, promoting immoral behavior. Now, let's return to the original question: if we lost our tendency to "beat ourselves up" over the past, would we lose any incentive to act morally? Would the proverbial dogs and cats start living together? To some, it's obvious: a person who doesn't feel guilt (which, I think, is another term for self-blame) is, in psychological terms, a psychopath, and therefore a danger to society. As we saw earlier, Wendy Kaminer argues as much in I'm Dysfunctional, You're Dysfunctional, writing that "there's a name for people who lack guilt and shame: sociopaths." However, as philosopher Gilbert Harman points out, that's not what psychologists actually think. Psychologists see the lack of guilt feelings as only one of several defining characteristics of psychopaths -- the others include antisocial behaviors like killing or stealing, a lack of empathy, and so on. In other words, the fact that someone is guilt-free doesn't necessarily make them a psychopath, just as the fact that my car has an engine doesn't necessarily make it a Lamborghini. For all the psychologists know, there may be many people out there who don't suffer over the past and nonetheless behave morally. What's more, clearly the threat of self-punishment isn't the only reason people refrain from antisocial behavior. Many of us, I suspect, don't even form the desire to harm others in the first place. I don't know about you, but as I go through my day, I don't usually find myself thinking "you know, it'd be great fun to kill that person, but I'd just feel so guilty if I did." I also suspect that many of us abstain from hurting others because we care about them, and want to see them stay well. And, at the very least, surely the fear of getting caught and punished by others -- which is distinct from the fear of self-punishment -- deters some people from criminal activity. My point is that I think there's reason to question the notion that, if people let go of their tendency to self-blame, widespread chaos would ensue. Hopefully, this will give some solace to people locked in a painful cycle of self-flagellation. Next up: Is the responsibility ethic anti-compassion?